Showing results for tags 'CF-2'. Time to sell my KV-4 - it is in good working order - there are a couple of small nicks on the back corners of the cabinet and the front grill has a small crack in it and a small discolored spot. Looks good - but it is not in mint condition. Really would prefer local pick-up. Thanks! Touch-up Paint Rec for Epic CF series? CF-2 Klipsch Epic CF-2 - underwhelming? 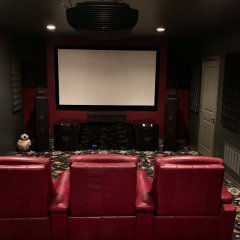 Hoping someone who's owned Epic CF-2 or other Epic series speakers can help - I picked up a pair of Epic CF-2 speakers this week but they don't sound so great. I would have failed them at the demo but thought the space might have had something to do with dissipating bass (1,500 sq. ft. garage with bay doors wide open). What don't I like? Simply put, they aren't nearly as musical as the pair of KG 3.5 I bought two weeks ago. The highs are decent, but mid range and bass are both muddy and poorly defined. The KG 3.5's playing Eva Cassidy "Live at Blues Alley" blow them in detail - and they're not even that detailed! So, what gives - is it possible this is a bum pair and need crossovers replaced? Or is the KG series more musical, more natural-sounding? Is it too much to ask for CF-2's to handle 2-channel duty; are they better as rear surrounds above 80 Hz? Any help would be appreciated - thanks! --Scott O.
I'm looking to upgrade to some newer smaller stuff. I wheel and deal on eBay and thought and I may have a better chance finding buyers here. The cf3's are black and cosmetically in good shape for their age. The cf2's have no enclosure (except my custom one they are in now) but I do have all the parts including the damping material (volume of damping material can be installed as designed that way). The drivers are in great shape. The KV-4 center channel has the same horn as the cf2's. It is in good condition as well. I'm doing some photographing this weekend so I can post the pictures soon.